Humans are dependent on liquid sprays for innumerable industrial processes that facilitate and enrich their everyday lives, for instance, developing machinery to water acres of farmland, devising the most efficient method for fuel injection in engines, or painting a car. However, scientists must pay attention to the little things to perceive how to make liquid jet spray cleaner more effective: they have to observe fluids that flow in atomic, microsecond detail to start gaining insights into one of the great challenges of science—turbulent motion in fluids. Experiments are a crucial tool for perceiving industrial spray processes; however, researchers have largely relied on simulation for gaining insights into as well as modeling the laws that govern the turbulent, chaotic motions that occur when fluids flow quickly. A research team headed by Prof. Dr Markus Klein at the Bundeswehr University Munich (German: Universität der Bundeswehr München) learned that to efficiently and accurately model the complexities of turbulence, it is necessary to use high-performance computing (HPC), and recently, the team has been employing Gauss Centre for Supercomputing (GCS) resources at the Leibniz Supercomputing Centre (LRZ) in Garching near Munich to develop high-end flow simulations for gaining better insights into the turbulent fluid motion. “Our goal is to develop simulation software that someone can apply commercially for real engineering problems,” stated Dr Josef Haßlberger, a collaborator on the Klein team. He collaborated with colleague Sebastian Ketterl on the computational project. The research by the team was recently selected for the cover of the Journal of Fluid Mechanics. While engineers and scientists refer to liquid sprays, there is a little more subtlety to it than that—a majority of the sprays are in fact multiphase phenomena, that is, some combination of solid, liquid, and gas is flowing at the same time. In the case of sprays, this usually occurs through atomization, or the disintegration of a liquid fluid into ligaments and droplets, ultimately forming vapors in certain applications. It is necessary for scientists to account for this multiphase mixing as part of their simulations with adequate detail to perceive some of the minute, basic processes that govern turbulent motions—particularly, how droplets are formed, coalesce, and disintegrate, or the surface tension dynamics between gases and liquids—while simultaneously capturing a sufficiently large area to observe how these motions affect jet sprays. Droplets are formed and impacted by turbulent motion, but they also further affect turbulent motion after they are formed, giving rise to the need for extremely detailed and precise numerical simulation. For modeling fluid flows, researchers can use various different techniques. Of them, direct numerical simulations (DNS) provide the greatest accuracy, as they begin with zero physical approximations related to how a fluid might flow and recreates the process “from scratch” numerically down to the smallest levels of turbulent motion (“Kolmogorov-scale” resolution). Owing to their high computational requirements, DNS simulations can be run only on the world’s most robust supercomputers, such as SuperMUC at LRZ. 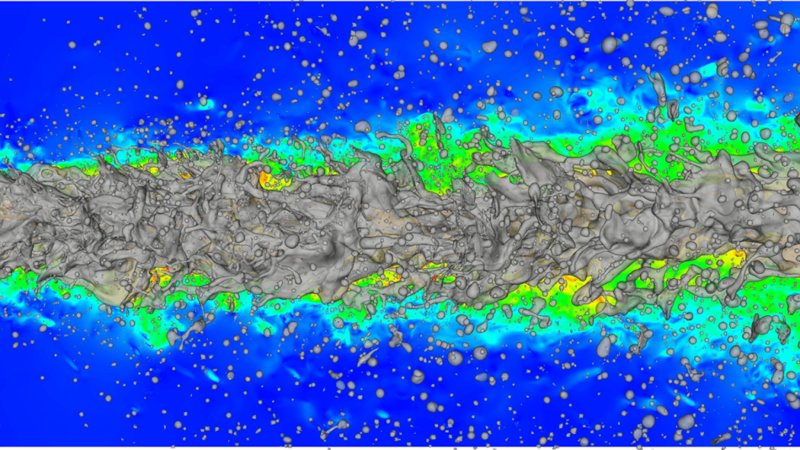 Large-eddy simulations (LES), which is another common strategy for modeling fluid flows, make certain assumptions in relation the way fluids will flow at the smallest scales, and rather concentrate on simulating larger volumes of fluids over longer periods of time. However, if LES simulations are to precisely model fluid flows, the assumptions developed into the model must depend on quality input data for these small-scale assumptions, thereby giving rise to the need for DNS calculations. The researchers simulated turbulent flows by creating a three-dimensional grid that contained over a billion individual small cells, solving equations for the entire forces that act on this fluid volume which, according to Newton’s second law, result in the acceleration of a fluid accelerating. Consequently, it is possible to simulate the fluid velocity in both time and space. The difference between laminar (or smooth) and turbulent flows is dependent on how fast a fluid moves and also its thickness, or viscosity, and apart from the size of the flow structures. Subsequently, researchers put the model in motion and calculate liquid properties from the moment it exits a nozzle until it disintegrates into droplets. The team started developing new models for fine-scale turbulence data based on its DNS calculations, where the data can be used to inform LES calculations, eventually helping to commercialize more accurate jet spray simulations. LES computes the energy carrying large structures; however the smallest flow scales are modeled, that is, LES calculations prospectively offer high accuracy for a considerably more modest computational effort. Despite making progress in enhancing LES models by gaining a more basic understanding of fluid flows using its DNS simulations, the team feels there is more scope for improvement. Although at present the team can simulate the atomization process in-depth, it would intend to perceive additional phenomena that occur on longer time scales, for example, combustion or evaporation processes. Next-generation HPC resources will play a vital role in bridging the gap between academic-caliber DNS of flow configurations and real-time experiments and industrial applications. This will open the door for more realistic databases for model development and will offer in-depth physical understanding of the phenomena that are challenging to observe through experiments. Moreover, the researchers have more efforts to make to implement their improvements to LES models. The next challenge is the modeling of droplets that are smaller compared to the actual grid size in a typical large-eddy simulation, but still have the ability to interact with the turbulent flow and can contribute to evaporation and momentum exchange.